The popular M9 cylinder is a great balance between portability and oxygen supply duration. The M9 is less than 16 inches in length and weighs only 4.5 pounds yet can supply up to over 5 hours using the RESOURCE v.2 pneumatic conserving device or just under 24 hours using the SOLO2 pneumatic conserving device. This cylinder can be conveniently transported using the CD1005 backpack, the CD1002 shoulder bag, the CD1008 fanny bag, or the CD1009 horizontal bag. 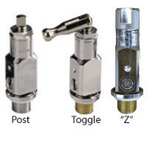 This cylinder comes standard with a CGA870 medical post valve but can be fitted with a toggle valve, a "Z" valve, a handtight valve ,a handtight and gauge valve, or a CGA540 valve. Select your choice below.